There are so many types of mouthwash options available on the market. Some of the available mouthwash options are definitely the older generation that are still being sold. That being said, I wanted to find the brand that yields the best outcome. Mouthwash with alcohol is a reminder to me of the original type of mouthwash. It was good for killing bacteria and viruses. The alcohol would sting and was fairly uncomfortable. Every commercial back then simply an encouragement to vigorously swish for 30 seconds. Additionally, mouthwash with alcohol dries out your mouth, which create an airless environment that allows anaerobic bacteria to thrive. Anaerobic bacteria is a major source of bad breath. The original Listerine has a alcohol level of 26.9%. Fluoride is a naturally occurring element, however the fluoride in mouthwash is created artificially in labs to control for purity. Fluoride mouthwash is the major active ingredient that most people consider when purchasing mouthwash. Fluoride has been proven to be beneficial for teeth by preventing tooth decay by plaque bacteria and acids (from acidic food). The evidence is so conclusive that many municipalities have proactively added fluoride to the water supply that has reduced tooth decay in children. Many toothpastes have fluoride and its only right for mouthwash to include it as well. Just remember not to eat or drink anything for 30 minutes after using fluoride to allow the fluoride to harden on your teeth. Fluoride remineralizating your teeth by filling small gaps in your teeth that were the cause of demineralization. When the fluoride is deposited on your teeth, it then attracts calcium (the original tooth material) to damaged areas to form Calcium Fluoride. This process creates a type of material that is actually harder (more resistant to demineralization of teeth). More detailed explanation here and here! Even though an acidic oral environment is the cause of demineralization, studies have shown that mouthwash with fluoride works better in slightly acidic environments. It is therefore ideal to choose a mouthwash that is not basic. ACT Restoring Mouthwash has a pH of 6.6, which is perfect. Without the right acidic environment, reservoirs of CaF are created that will be used the next time there is the right environment. Therefore, prolonged use of an fluoride mouthwash will result in a constant reservoir that will result in better long term teeth health. Too much fluoride can result in dental fluorosis (white specks on teeth) or skeletal fluorosis (pain/aches in joints). But as long as you avoid swallowing fluoride mouthwash, you should be fine. Pros: Effective a protecting enamel and promoting remineralization. Conclusion - What Mouthwash I Use? I'm a firm believer in challenging many of the facts of life we learned growing up. So with what I've learned about mouthwashes above, I've decided to take the approach of using both a mouthwash with fluoride to protect my teeth and an alkaline mouthwash to help kill off bacteria. 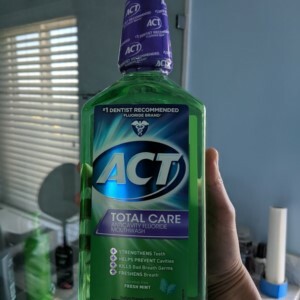 I opted to use the ACT Mouthwash with fluoride (check price) in the morning because it's easy to wait 30 minutes on my drive to work and because it'll be good to protect my teeth all day. At night after I brush my teeth, I use Uncle Harry's Natural Alkalizing Miracle Mouthwash (check price), an alkaline mouthwash, to help kill any bacteria. The alkalizing mouthwash does sting a little bit, but is manageable. I feel like I don't need as much fluoride protection at night since I'm not eating acidic foods (like soda, certain nuts, certain fruits, coffee, etc). With this strategy, I can get some of the benefits of fluoride + alkaline mouthwash. Not to mention that the toothpaste I use also has fluoride.